The Hydrostatic (automatic) transmission, available on the Husky 775, 1225, 1250 and 1455, gives Bolens tractors a greatly increased efficiency and versatility. These hydrostatic transmissions are manufactured by the Eaton Marshall Division of Eaton Yale and Towne, a national leader in fluid systems far the automotive industry. (1) Smooth speed change from full forward through zero to full reverse with a single control, without use o£ hands. (2) Complete matching of power to load. (3) Positive control and instant braking. and controlled by a lever within easy reach of the operator. In addition, a position gauge indicates the original height of the attachment, and the operator can relocate any implement precisely. Forward and reverse are bath controlled by the right foot pedal. This is a distinct engineering advantage of Bolens units with hydrostatic transmission. Clutch and gear levers are completely eliminated and replaced by variable forward and reverse control pedal, This convenient foot control allows both hands freedom to steer and operate attachments. Available on the Husky 850, 1050, 1220 and 1225, Bolens exclusive controlled differential allows the tractor operator to match traction require meats to ground conditions. A screw knob located on the left rear wheel tightens a brass conical shaped collar (which is keyed to an axle driving the right hand wheel) into a mating content shape in the left hand wheel. Another important feature of this hydrostatic drive is the reversing characteristic of braking. When braking. 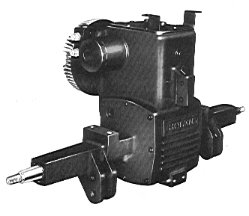 the motor becomes a pump in a closed hydraulic circuit. The roles o€ the pump and motor are reversed so that the pump, engine and control system brake the wheels. When the pump is at zero angle, no flow can take place and the drive is lacked hydraulically. This increases friction between these two ports to a almost locked state. 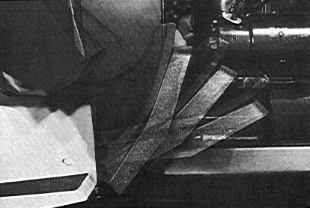 Thus, differential action between the wheels is gradually reduced (by turning the knob clockwise) until the action is practically eliminated and both rear wheels have driving power.